I discovered Mary Renault quite by accident. A most happy accident, indeed. There are many ‘types’ of novels I enjoy reading (well-written ones that is). Isolation stories, The Templar Knights, thrillers involving a hunt for a religious artifact, autobiography as fiction, classics, gothic stories, and Greek Mythology and history to name a few. 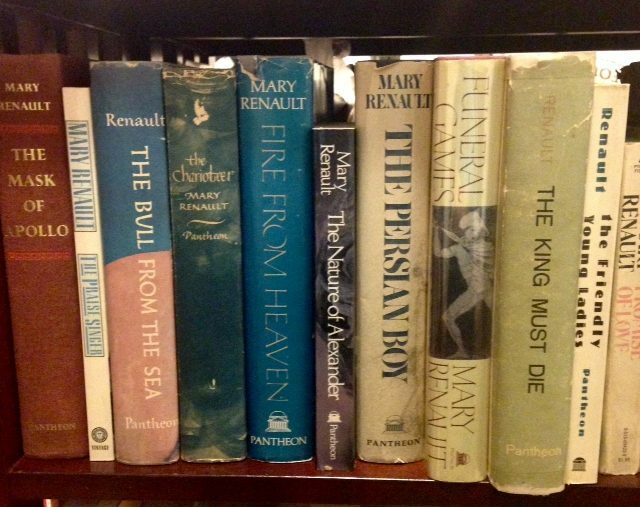 Mary Renault, to me, is the ‘Anne Rice’ of Greek history with a wonderful catalogue of novels of Ancient Greece, several twentieth century set novel, and a wonderful biography of Alexander the Great. She has a few ‘romance’ type novels, but I’ve not ventured into those. Renault’s most revered works depict numerous familiar names from Greek history and mythology and paints a far broader canvas for her characters than history books ever could. In her Ancient Greece set novels, as in her contemporary (1950’s) work The Charioteer, Renault’s writing does not shy away from depicting the ‘commonplace’ relationships that men shared with other men in their society and time. Socrates, Dionysius, Theseus, and Plato all gain greater depth and apotheosis under the skilled pen of a writer clearly in love with the society and rituals she chose to devote the greatest part of her career writing about. Under Renault’s artisan treatment, the characters, social mores, and settings all come to resplendent life where the day to day affairs of a long since passed civilization are offered in greater abundance than many textbooks can boast. Renault herself lived with another woman, Julie Mullard, whom she met during her training as a nurse upon graduating from college. Long rumored to be in fact a gay man writing under a female pseudonym, based upon her affectionate and compassionate treatment of relationships between males (even of a significant enough age difference that they would be labeled as pederasty at the time her works were published and still today but were considered unexceptional and pedestrian at the time Renault wrote about), the writer lived relatively openly with her female partner, but sought to distance herself from being labeled as a ‘gay’ writer, either male or female, and was herself a fervent detractor of the pride movement of the 1970’s. Finding herself wanting to forsake the repressive atmosphere and attitudes that gays and lesbians faced in Great Britain at the time, Renault and Mullard moved to South Africa where they spent the remainder of their days. Finding a much more relaxed posture and even a community of expatriated gay and lesbian compatriots in their new home, although they were still dismayed enough with some of the other non-liberal views in their adopted home and took a stand against apartheid in the 1950’s. Mary Renault’s health declined into her seventies; first becoming evident when she developed an ‘irritating’ cough and fluid was found on one of her lungs which had been aspirated, but at the time it appeared there were pockets of the fluid that could not be reached. The cause of the fluid developing was cancer. Renault passed away in 1983 at the age of 78, leaving behind a legacy of having eased the stress of accepting themselves and then coming out to others that many gay and lesbian readers had experienced finding a ‘champion’ in the voice of Mary Renault. Although she was criticized by some for her negative view of the post-Stonewall push for greater tolerance and acceptance for gays and lesbians in such a public fashion, Renault believed that a person should not accept a label of being gay as their primary identifying characteristic. Renault also left behind eight historical novels of Ancient Greece, six ‘contemporary’ novels, as well as her Alexander biography (some criticizing of this work calls it overly romanticized and not critical enough of the person and man) and a non-fiction treatment of the Persian wars. Having read all but one of her Ancient Greece works (I am saving one, just one, for a years from now revisit to one of my favorite authors), I encourage anyone with an interest, either romantic or scholarly, in the society Renault brought to vivid life to seek out her works. Her Alexander trilogy is amongst my favorites, yet all are eminently readable and highly enjoyable. Mom’s journey with dementia, at least from the point of factual diagnosis and not just a suspicion on my part, has been ongoing for two years now. It was August of 2014 when I accompanied her to an appointment with her primary care physician, mentioned that she’d had a prior ‘cognitive’ exam and perhaps an updated one was a good idea as there were some ‘gaps’ cropping up. Two years since she was referred to the geriatric medicine center of Maine Medical Center and diagnosed with dementia. Two years since her life as she had known it for so many years began to unravel before her eyes. Her carefully built wall of defenses was crumbling. The explanations and assurances she had given for so long for repetitious conversations and grasping for names and details more and more were no long holding up to mask what was really going on with her. Her memory was disappearing. Her ability to figure out a process or to pull a word from her 80+ years of building vocabulary were becoming more and more compromised. I can’t pinpoint an actual date or month or even a seasons when this began. I can say it was within the past ten years….more than five, less than twelve, but there’s not one single occurrence or ‘slip’ or concern that arose and gave me pause and led me to think ‘maybe things aren’t quite 100% with her’ for the very first time. It was lots of little things that in and of themselves were able to be justified or overlooked without much distress and anxiety – but when strung together they became a procession of clues that Mom’s cognitive ability was on the decline. It came without fanfare, without signal, without omen or caveat, and without mercy – much like Christmas in Whoville, ‘it came without ribbons, it came without tags, it came without packages, boxes or bags.’ There was no overcast sky or bone-chilling wind; no cautionary background music or telling sound effect, no blaring horn or raid siren going off. None of this preceded dementia. Ever since Mom’s journey started, the decline has been, to me, relatively rapid. For several months she still maintained an apartment, yet all the while I was noticing greater chasms in the years and details she was losing. I noticed her growing more frail. I noticed her getting more and more anxious having new routines introduced into her life. New doctors, new medications, new diet, new home…..all these things, every one of them necessary to her overall well-being and safety, brought upon her like shouting back at the dementia raising my staff and shouting ‘GO BACK TO THE SHADOW – YOU SHALL NOT PASS!’ like the grey wizard Gandalf to the Balrog on the bridge of Khazad-dûm. And yet over time she still lost names, and places, and dates, and other details – little by little, one by one. The names of her parents, the circumstances of their deaths – even the fact of their deaths as she asked me recently if she’d told me what her mother said to her on Mom’s 80th birthday. Mom’s mother passed away when Mom was in her early 30’s…a full 50 years ago now. I’ve been doing all I can to ease her through this process. Acting as if all the repeated conversations are being heard for the first time – all the answers I give her for the repeated questions are being given for the first time. When she brings up the anxieties that seem to plague her either daily, weekly, or on a six week loop (lately that has grown for many things), we talk, calmly, and I do all that I can to explain things to her in a way that will mollify her. In a way that will smooth the rough spots out and de-escalate her worries somewhat. It’s not any kind of special trickery or shrewdness. It’s a calm voice. A reassuring tone. Talking to her in a way that is respecting that she’s an adult, not a child; not telling her what to do, but rather rationalize with her what is in her best interests and what she knows she should do for herself. In my mind, it’s also the decades of talking to her and listening to her about her thoughts, her family, her life, her fears and building a trust between us that I would take care of her no matter what. It’s the 47 years of her being my mother and my being her son that she is still able to process that if I tell her she’s safe – she accepts it. If I tell her that although she is remembering something differently than I am, what I am telling her is the truth. In my mind it’s been all a combination of these things. In the past few weeks Mom has called me and left me a few messages in between our daily calls (she often forgets we’ve spoken already or that I’ve told her I’ll call in the evening the next day, which is fine, understandable) and on my voice mail she’s said hello and then said, “this is….” and then paused for a moment before she identified herself as ‘Aunt Carrie’, rather than as ‘Mom’. She leaves me a message, I call her back, I don’t correct her on the ‘Aunt’ thing. She’s talking to a machine, not me, she slips, it happens. She knows who I am when we actually speak, calls me by name, calls me honey when we’re talking, same as always. Sure, she doesn’t remember where I live or what my age is (it goes back and forth, some days she does, some days she doesn’t) but the basics are still there, I’ve told myself for weeks now. Amazing what we can convince ourselves of when we want to. Just over a year ago she told me she promised she’d never, ever forget who I was. I told her that even if I wasn’t in her head, I knew I’d always be in her heart, and let her off the hook from the promise immediately. I knew she couldn’t keep it – through no fault of her own. She knew it too, I know. I think she was trying to convince me more than herself at the time. Four nights ago we were talking and she thanked me, again, for making the time to call her every day. The conversation was a bit different than usual – just a slight modification in the way she carried herself on the call – something in her tone that was not the norm for her. Something less ‘familiar’ and a bit more ‘impersonal’ about how she spoke. Something that, knowing her the way I do, as well as I do – I knew immediately what it was. I replied, again, that calling her every day is my pleasure, that I enjoy talking with her and look forward to it each day. “You tell me, who are you?” I asked. “Right, but who are you to me?” I asked. Perhaps she didn’t hear my voice crack slightly, but I noticed it, as I went toe to toe with my own denial ready to face the consequences, ‘ready’ being a relative term – full of caveats and cautions and forewarning. “Well – we were neighbors for a long time, and we’ve always been good friends.” she replied. Dementia creeps up on a person without warning. It submits no proposal and awaits no committee approval. It arrives on our doorstep and invades our home without auspice or invitation. It just appears one day and stays there until it carries first the mind and then the body away. It’s stealthy and voiceless; predatory and reticent. It skulks around for a while before it takes a person forcefully yet silently. It’s like the tears that roll down your cheeks as you sit in a chair in a room in your house that you sit in every day while you talk to someone that you talk to every day. It’s those tears that you cry, without wailing and sobbing, just a stream of tears coming out of your eyes and you feel them there, making their way down your face wet and bothersome, while you sit in your chair stoically and compose yourself so that you don’t betray the anguish going on inside of you, anguish you convinced yourself you were prepared for just because you knew it was coming, and yet now you find yourself realizing how naive a thought that was, because right now, in this moment you have no idea how to process the realization that this woman who you speak with every day, who bore you and raised you and taught you many, many things and was a constant in your life for forty-seven years and yet suddenly you know, just by a slight variation in the timbre of her voice, no longer knows she’s your mother. Dementia is like that as it pillages a life and a mind. It’s just like that – feline and bucolic just like those tears that you cry and keep yourself from sniffling or letting your voice break as you say goodnight and give the assurance that you’ll call again tomorrow, as usual. Just like the moments after you hang up and you realize that your life is forever altered now and there’s nothing at all you can do to change it so why scream and wail and carry on at all in the face of incapacitation? That’s what dementia is like when it trespasses into our lives and takes and takes and takes from us. It’s just like that. There is a Dylan Thomas poem that I first heard of in, of all places, a Rodney Dangerfield film called Back To School in which he accompanies his son to college and enrolls as a student himself. Thomas’s poem is about living boldly, living fully, even as we age and reach the conclusion of our journey – to continue to burn with life. I think Dylan Thomas was unfamiliar with Dementia and Alzheimer’s Disease. On my daily call with Mom yesterday she mentioned that she’d been out earlier, gone to her brother Logan’s, and picked up a book. She noted this happily, as if it had lent an unexpected happiness to her day. She truly believed that’s what she’d done. Had it been ‘real’ I would have been happy for her. Her brother Logan passed away more than a decade ago. The decline in her cognitive abilities is more rapid these days it seems. She has begun asking me, nearly each day, who she was married to, who are the children that live with me, etc. She sometimes hesitates before speaking my name, or responds to me initially as if she’s suspicious that I’m a telemarketer or a bill collector. She asks me where I’m living now, and how old I am. Each question she asks she has known, in the past, the answer to without having to ask. Lately she’s needed more and more prompting. For most of my life, I would have said that my mother would have ‘raged against the dying of the light’. That’s not to say that she travelled extensively or participated in numerous social functions and clubs and read classic literature and developed an appreciation for opera – she did none of those things. Mom’s favorite author (to this day) is Danielle Steele. She only ever left the country to cross the border into Canada, and the first time she attempted such a feat she (and her companions) chickened out as they feared they wouldn’t be let back into the U.S. upon return for some unknown reason. Mom wasn’t one to socialize readily (much preferring a one-on-on lunch or someone popping in to see her now and then), and most likely the closest she ever came to opera appreciation was watching ‘What’s Opera Doc’ with me on Looney Toons with Bugs Bunny in drag sitting atop a near morbidly obese cartoon horse and Elmer Fudd wailing about how lovely his Brunhilda was. Mom lived in her own home, in retrospect, longer than she should have. The early warning signs of Dementia were there, certainly, but not significant enough to convince her to do anything about it any earlier than she did (or, more to the point, to accept what had to happen any earlier than it had to happen in which she realized, at some level, she had no other choice). She gave up cooking (saying her back bothered her too much to stand that long) and existed on store-bought quiche and cooked chicken breast. She drove anywhere she needed to go, even transporting others occasionally, until her license was taken from her when she could no longer identify road signs and their meaning. She stayed to the tried and true route to get anywhere rather than ever seek out a shortcut, becoming annoyed with me when I drove her somewhere and took another way that I knew was faster. When yard work and snow shoveling became too much for her, she hired out, constantly annoyed at the cost associated with that, but conceding that she could no longer do it herself (having fallen at the end of the driveway into the ditch that ran along the front edge of the property). She kept a calendar, a large one, handy to her favored living room recliner and made notes on it as to her day-to-day activities (such as ‘August 5 – saw Tammy, had lunch, great time, warm day’) which I realized had become her talking points in conversations with me (I found the calendar when cleaning out her house and imagine now that she would, as we talked on the phone, consult this calendar and improvise and embellish with just enough flourish to her tale to pass as her own unaided recollection of events). For some time, she managed to not go gentle into that good night. Now, the darkness is overtaking her. I hear people describe Dementia as many things – a ‘fog’, a ‘memory thief’, a ‘slow disappearance of the mind’, etc. ; many ways to say the same thing, as if your mind, your identity, your whole life is collapsing in on itself. The thoughts and remembrances you cling to of lost loved-ones and comforting conversations and passed on wisdom disintegrate until there’s not a trace left of them. Mom fought it off for a long time with her notes, her carefully worded explanations, and her assertion that she was ‘doing just fine’ no matter what new ailment or obstacle had befallen her. The child becomes the parent, and the parent becomes the child. For all the imploring of Dylan Thomas – Mom cannot help but go gentle into that good night. She has not the presence of mind any longer to ‘rage’ against the dying of the light – to continue to burn with life as the candle shrivels and the flame flickers to an ebbing before it is finally extinguished. The ‘close of day’ finds her looking at the shadows on the walls and, as she has told me, realizing that she doesn’t know for sure if anyone is out there, outside her room, in case anything happens to her for what seems like hours (though it could be just half an hour) until someone pokes their head in and checks on her. As Mom’s mind fades more and more, I find myself holding onto a belief that with the passing of her good memories, equal in number are the bad ones that disappear as well. That a life of regrets, which she conveyed to me over time, becomes more of simply a ‘life lived’, and the regrets are no longer ruminated upon, no longer a weight upon her, no longer an ever-present part of her day. Mom was never a ‘wild’ person – like myself she was cautious and heedful of unexpected consequences, although often to her (self-admitted) discredit; whereas she has expressed to me (several years ago now) a wish that she’d not been so ‘afraid’ of life at times that it prevented her from living it more fully. What she truly meant by that, those things she allowed her fear to obstruct her from doing more of, taking more risks and allowing happy accidents to more fully illustrate her experiences in life – is now lost somewhere in the same vapor that once was her ‘raging’ against the dying of the light – her passion and determination to keep her precious independence, taking whatever steps necessary to fortify it against the thief of awareness that, more and more, was pillaging that very independence from her. As Dylan Thomas wrote; blind eyes could blaze like meteors and be gay. Sadly, life seemed to have another happenstance in mind for Mom. The blaze continues to fade, the night to settle in more fixedly, more securely, holding her in its grasp as the blaze dims, the meteor paling as it continues its migration into the abyss that claims us all, eventually – the past. I tried, for a long time, to rage for her. To try to stave off the dying of the light. But that time has been displaced. Dementia wins, and the fool that I was to try to stand up to it and conquer it must capitulate. There’s only one more thing that I can do for Mom. I can make going into that good night as gentle as possible.